PrehKeyTec Keycaps are available in 1x1 2x1 3x1 and 2x2 sizes which can be used anywhere in any orientation on a row and column layout. Relegendable versions feature clear covers that protect the paper legend from dirt and moisture. Solid top versions come in a rainbow of colors many of which are suitable for laser etching of alphanumeric characters and most graphics of your own design. 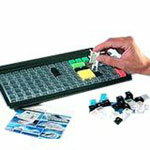 Pre-legended alphanumeric sets and PC command keys are also available. Multi size keys feature a patented self-leveling design that assures a smooth even feel no matter where you push on the surface of the key.